This beloved event is coming up THIS WEEK!! Players for the parent’s team still very earnestly sought – no experience necessary, just a sense of fun. Merriam Staff Vs. PTO Basketball Game! Thursday, November 30th at 6:00pm (doors open at 5:30pm) at the RJ Grey Junior High Gymnasium. 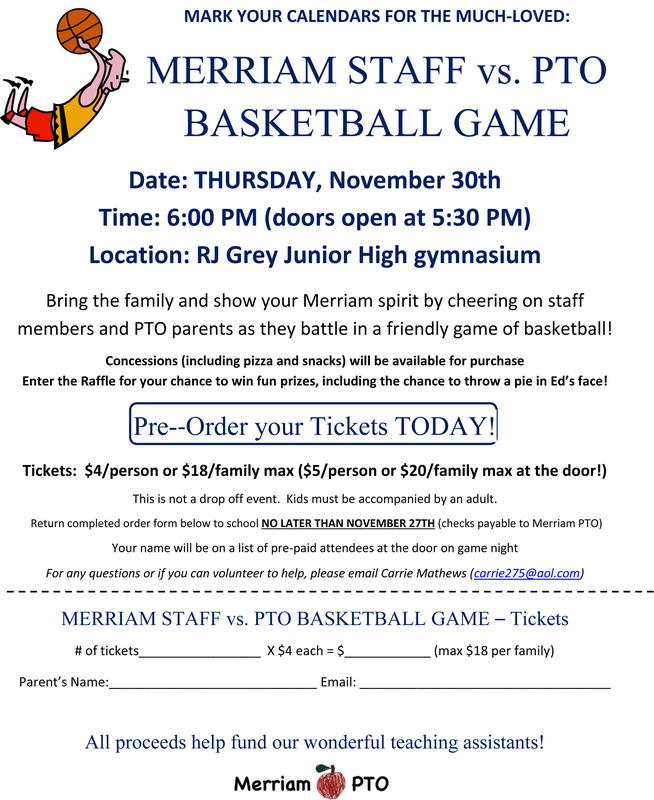 Our annual, much-anticipated Merriam Staff versus PTO basketball game is coming on Thursday, November 30th with doors opening at 5:30 PM. This event is a fun night of silly basketball, loud cheering and yummy food. Back by popular demand will be the raffle to throw a pie in Ed’s face as well as other fantastic teachers who are up to the challenge! Our event coordinator, Carrie Mathews, will be looking for some help making this night a rousing success for the Merriam community. The PTO will also be looking for some basketball players to fill out our roster. The only skills needed are the ability to have fun and be silly. We hope to see many of you there to cheer on the teams! Merriam Literacy Night at The Silver Unicorn meets Merriam Dines Out at Legends!